Eating Exeter spills out to other places around Devon sometimes, and this time we head to Torquay. Torquay is a hotch-potch of little suburbs and villages, out of town retail complexes and a whole load of other attachments too including Paignton, Brixham and Babbacombe to name a few. To anyone unfamiliar with Torquay, there is a diverse range of eating establishments that can bewilder and bemuse, but I am going to give you a good starting point. 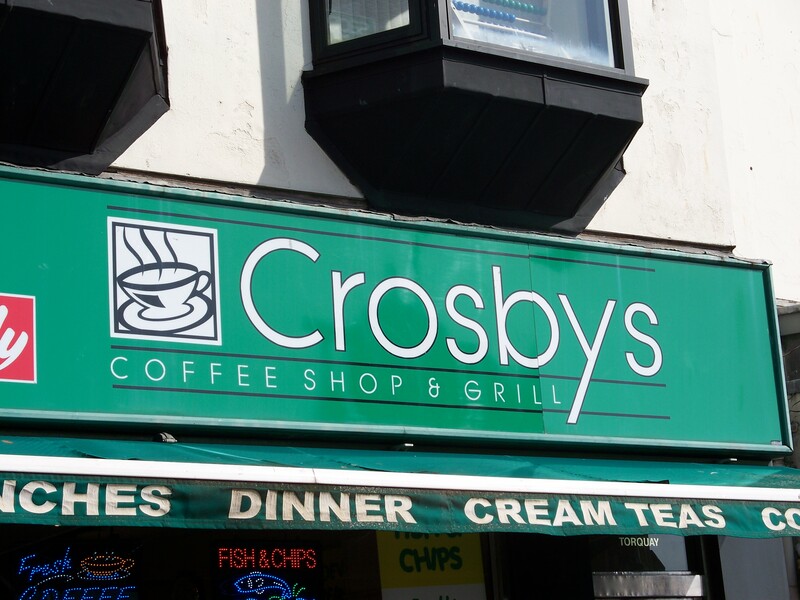 Crosby’s is set in a very central part of Torquay, at 1 The Strand. It is a TQ1 postcode and is at the bottom of Fleet Street, looking over the Marina and the Fleet Walk shopping centre, it is unmissable should you find yourself in the centre of Torquay. I find Crosby’s very hard to write about as there is a lot about it that I would normally moan about. The interior, the garish promotional signage, the palm trees and excessive interior foliage. But I can’t. When writing about a restaurant or cafe, or anywhere that involves reflecting on the ‘experience’ of eating in a place I can happily say that everytime I have been to Crosby’s I have had a wonderful experience despite its flaws. Upon first glance, Crosby’s really isn’t anything special to behold. The green sign with the uninspiring lettering is, well, functional if anything. It does the job and makes it slightly more obvious then it would have been without any signage. The metal framed double glazed window beholds palmed pot plants and an interior decor that does look like it hasn’t changed substantially since the early nineties. But there is a vague sense of familiarity that this sort of interior brings, it is almost comforting. When myself and my beloved visited on a Saturday lunch time, it was bustling with the usual Saturday lunchtime clientele. Old ladies meeting for lunch, shoppers taking refuge from the insanity outside and a few kids behaving themselves with tired looking parents relieved for a sit down. But it didn’t feel out of control, the pace was gentle and this was much to do with the professionalism of the waiters as they took orders, brought out food and maintained calm and control. The service was incredibly friendly and very attentive. When one of our party dropped a knife, from the other side of the restaurant, the waitress called over and said, “I’ll get you another one!” The coffee’s and the tea’s were very quick, and those of us that had coffee were impressed as it was Illy Coffee. The menu promises a ‘£9.95 Steak Special’ and a ‘Two meals for a tenner’ offer too amongst the traditional fare of greasey spoon choices and healthy options too. There was a good fish menu, and from previous experiences I can safely say that the Fish & Chips is a meal that will have you coming away satisfied. I ordered a ‘Gut Buster Burger’ (£5.75) with a portion of chips (£1.50) (which upon reflection, I didn’t need the chips!) and the rest of the party had three portions of Fish & Chips. The fish was well cooked with a crispy light batter coating it. The chips were perfect, with a crispy outside and the standard hot and soft inside that every good chip should be. My burger was a bit singed around the edges, however this only added extra strength to the chargrilled nature of the burger. 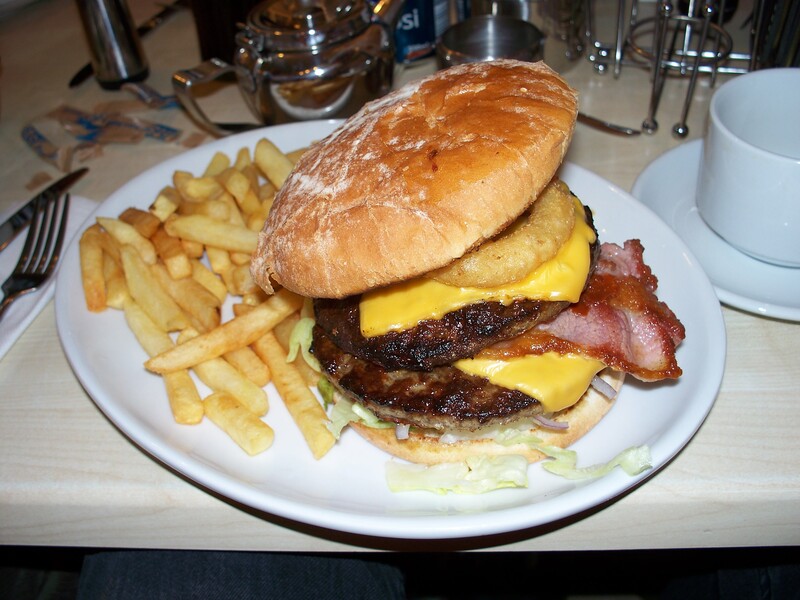 The cheese was perfect and there were generous amounts of bacon and onion rings within the burger itself. The perfect burger in everyway, apart from the singed bits. The meat was tasty and not overdone and the burger maintained its shape whilst I tried to eat it with my hands (a task that was considered impossible by everyone witnessing it. I proved them right). The bill came to £33.50 for four of us, that included drinks. It was fantastic value with some of the friendliest service that you are likely to receive in the area, upon reflection it occurs to me that this might be the best place to eat in Torquay but recommendations are gratefully received, see the comments section below the article. Overall, a small restaurant with dated interior. But this is made up for with the friendly staff and stunning food. Excellent value, prepared to feel satisfied!